2014 was the year of science supporting the benefits of organic food and farming: for human health, pollinator health, and the health of the environment. To help you ring in the new year and truly turn over a new healthy leaf, The Organic Center has transformed the top ten studies of 2014 into New Year's resolutions that show how to improve the state of your diet and the state of our planet by choosing organic. A review of the latest research on the effects of organic agriculture and crops on public health found a clear health advantage in consuming organically produced food instead of conventionally produced. Published in the International Journal of Environmental Research and Public Health, the findings concluded the lower pesticide residue levels in organic produce were a significant factor in helping account for these benefits. Pesticides, linked to numerous health problems, are still found on conventional produce in the grocery store. A study showed that eating an organic diet for just seven days can significantly reduce your exposure to pesticides. The research found pesticide metabolite levels in a group of individuals who ate a diet of at least 80 percent organic for a week were cut by up to 96 percent. A key study of 2014 showed organic fruits and vegetables have higher levels of antioxidants. Researchers found that if you choose organic rather than conventional fruits and vegetables, you can get an average of 20-40 percent increase in antioxidants! Antioxidants protect our cells against the effects of free radicals, which can damage cells in the body and trigger disease. Commercial beekeepers are losing an average of 30 percent of their colonies each winter. This is a problem for bee-pollinated crops such as almonds, apples, cucumbers, avocados, oranges, and berries. One of the major contributors to bee deaths is exposure to pesticides, particularly neonicotinoids. In 2014, a study published by Harvard researchers supported and strengthened research in 2012 that found a link between neonicotinoid use and colony collapse disorder. A disease called citrus greening has devastated thousands of acres of citrus trees in the United States, and may even cause domestic citrus to disappear altogether. Research on controlling this disease focuses on toxic pesticide sprays and the development of GMO citrus varieties. The Organic Center has teamed up with professors at universities, industry members, and organic growers to launch a large-scale study looking at organic solutions to citrus greening. Visit the Organic Center Citrus Greening page. Research shows good news for climate change mitigation: organically managed soils could reverse the trend of increasing CO2 in the atmosphere! Conducted by the Rodale Institute, the research looks in-depth at how farming systems affect greenhouse gas emission, and illustrates the ability of soil to mitigate climate change when managed organically. A study in the Journal of Applied Ecology found that organic farms support more species than conventional farms. On average, organic farms support 34 percent more plant, insect, and animal species than conventional farms. When the researchers looked at pollinators such as bees individually, they found that organic farms had 50 percent higher species diversity. A study on healthy soil biodiversity published in Agronomy for Sustainable Development found that conservation and organic farming techniques boost the number of soil organisms when compared to conventional farming. The researchers measured soil life over a period of 14 years and found that versus conventional systems, organic and conservation agriculture systems had more earthworms in the soil, 30 -70% more microorganisms, and improved bacterial pathways. Research shows that organic farming is healthier for birds. Songbirds are especially sensitive, because conventional farms can reduce food supplies for young songbirds unable to leave their nests. An article in the journal Agriculture, Ecosystems & Environment compared availability of "nestling" food on organic and conventional farms. Because organic farming does not use synthetic pesticides and has longer, more diverse crop rotations, organic farms were found to provide more available nestling food than conventional farms. Avoiding pesticides is even more important than previously thought. A study led by Organic Center Science Advisory Board member Professor Gilles-Eric Séralini showed that major pesticides are more toxic to humans than suggested by their active ingredients. Pesticides contain a mix of "inert" ingredients. These "inerts" are not taken into account in safety test trials, and the active ingredients are tested in isolation. This research looked at the toxicity of herbicides, fungicides, and insecticides when all ingredients were included, and found that eight out of nine pesticide formulations were up to one thousand times more toxic than their active ingredients. 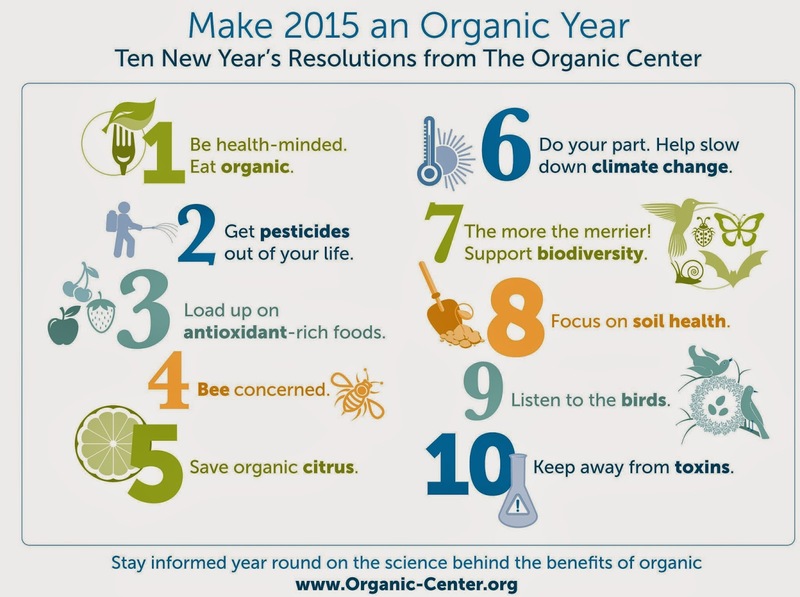 Help make 2015 an organic year for your friends, family, neighbors, and colleagues. Sign up for The Organic Center newsletter, and follow them on Facebook for the latest research on the science behind the benefits of organic year round. Stay informed…and pass your knowledge on!